Huether has been installing furnaces around the Rochester area for 45 years. We know how to keep the frigid winters under control and how to keep your heating cost down. Sizing the right furnace for your house is important. We come in, measure your home, determine the right furnace for you and install the most efficient system for your space. We specialize in Rheem and Heil for our furnaces for one simple reason. They provide are the best manufactured furnaces on the market. We support the full line of product from these manufacturers, but here are our two favorite furnaces to give you something to look at. Both of these units come with a limited lifetime warranty on the heat exchanger and a 10 year limited parts warranty on the rest of the unit. Two-stage redundant gas valve and two-speed induced draft blower adjust to higher or lower settings when more or less heat is needed. Heated air is delivered by an efficient ECM blower motor. This model is also compatible with two-stage cooling. Advanced dehumidification capability can reduce additional moisture in the air when paired with an air conditioner or heat pump and a humidity-sensing thermostat. 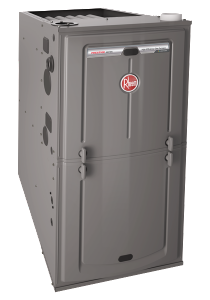 Industry-first patented features and 360°+1 engineering make the Rheem R96V Prestige Series Gas Furnace one of the efficient options available today. Let’s talk about quiet. 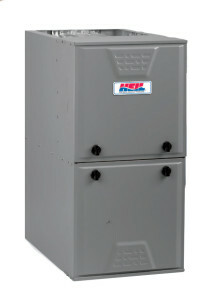 Rheem put a new heat exchanger design into this new furnace which drops the airflow noise by 20%.